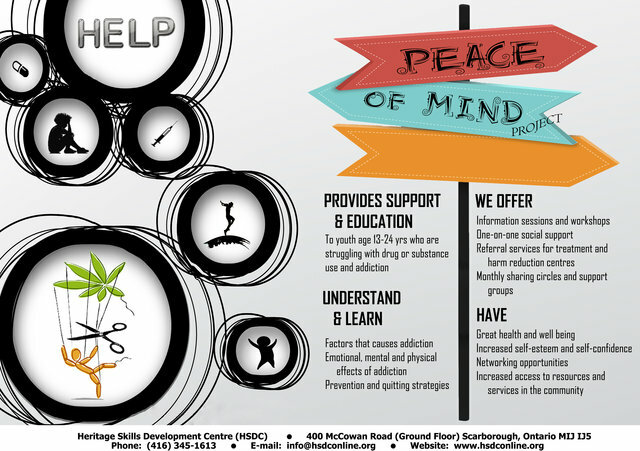 Heritage Skills Development Center (HSDC) with support of the Scarborough Addiction Service Partnerships (SASP) aims to provide support to youth age 13-24 in the diverse community who are at-risk of and/or struggling with drug or substance use and addictions. Also, we aim to educate, create awareness, provide supportive counselling, networking opportunities as well as increased access to resources for target youth and their families. To provide support and education for at-risk Afro-Caribbean youth in the Eglinton East and Kennedy Park area/ Scarborough area to help overcome drug and substance addictions, promote recovery, and build resiliency. We provide a safe and supportive environment that promotes cultural diversity and clients’ preferences, needs and circumstances.